Lady Liberty gets #MeToo’d, Scarlett Johansson pisses off trans-actors, Mayor Jim Fouts hates America, it’s Christmas in July as we talk to Gary Hoey, we try to reconnect with David Trump & Kennedy had a teen-mergency. Timothy Raymond is a Waterford man with terminal cancer who dreams of playing the national anthem on his harmonica at Comerica Park for a Tigers crowd. Timothy gets to fulfill his dream tonight so we give him a call to find out if he’s nervous & find out the Tigers want him to keep it to a tight minute & a half. Party-pooper Mayor of Warren Jim Fouts went on firework patrol on the 4th of July with Warren cops. Joey Chestnut retained his title by stuffing 74 dogs down his gullet. The top female contender won her category with a measly 37. 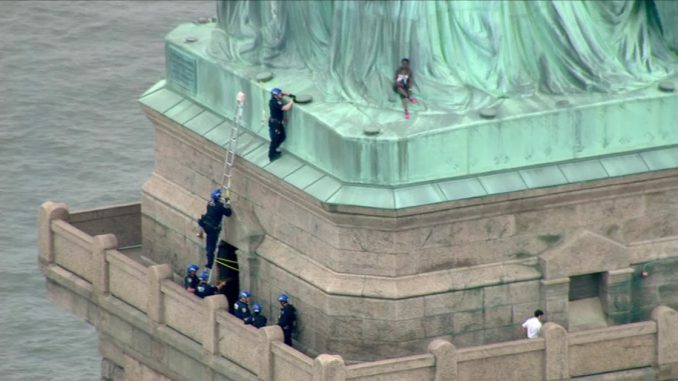 Some chick tried to climb the statue of liberty to protest Trump’s separation of children & parents. We’re not sure if she’s the best person to make that stand. Someone claimed it ruined his vacation. SIST: She only went 20 feet. Protestors in London got the go ahead to fly a giant Trump baby balloon over Westminster for the President’s visit. A Texas teen got attacked at a Whataburger for wearing a MAGA hat. Photos of kids wearing F&*K Trump shirts are floating around social media. Until every child is reunited with their families get ready for some hunger strikes. James Woods got BLOWN OUT by his agent on 4th of July for tweeting about politics. Scarlett Johansson is getting trashed for gender appropriation for her upcoming role as a trans man. David HOGG has already checked in on Scott Pruitt’s sudden trapdooring from the EPA position. 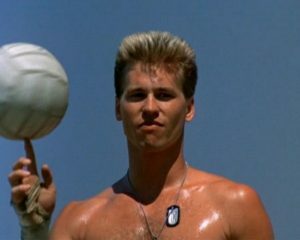 Trudi saw Super Troopers 2 on the 4th, but Top Gun 2 is the sequel everybody is waiting for. Drew rewatched Extract again last night… great movie. Gary Hoey is playing the Wildwood Amphitheater in Lake Orion July 14th & he calls the studio to talk about making some new albums, playing blues rock with Lance Lopez & Walter Trout, Gary plays some music for us live on the phone & we get an update on how Ho Ho Hoey is doing. The EMT that helped Heather Locklear & got drunkenly pummeled is suing for damages. The self proclaimed youngest flexer in the world has scrubbed her IG account, leaving only one ‘Help Me’ message. Kennedy had a teenage girl emergency & couldn’t make it to the show tonight. Her boyfriend DUMPED her at midnight & she needed a mental health day. Ariana Grande’s family is super worried that Pete Davidson is using her. It’s ok for Frankie Grande to be a leech though. Drew got back into some great clickbait today: top restaurant chains that no longer exist. How do media consultants work? Seems like an easy job. Marc was looking for C̶l̶i̶p̶p̶e̶r̶ Laker Darell’s number & stumbled onto David Trump’s number instead. We give Dave a call but think twice about leaving a message lest he flushes us out. Maz is holding Drew’s Champion’s Club tickets hostage because he doesn’t want to “let his kid down”. Thai Cave Kid Update: Still trapped, still chafed. Turns out swimming is a pretty important life skill. People going to the beaches to cool off are running into dense swaths of sweaty strangers instead. We call Maz to see if he’ll selflessly give up his tickets to Marc’s out-of-town nephew, but he doesn’t answer so Drew leaves him a message chock full of guilt. The Chesterfield scrooge that tried to steal Independence Day got an exponentially bigger firework show than he originally bargained for. A Detroit gas station got scammed for 600 gallons of gas by a duo dubbed the Petrol Pair. Maz calls back to passive aggressively relinquish his tickets this weekend. Human Rights Officer Ramzu Yunus is back to his old crap scamming people into thinking they’ll get a free house. Trudi has been filling in at WOMC here & there. Kind of late in the podcast but we might be able to squeeze in a callback from M.L. He tells us he’s lost power 6 times in the past 2 months & is experiencing a ‘half outage’ that powers only some things in his house.